A tribute to those scouts who have earned their Eagle Scout Badge, the highest rank in the Boy Scouts of America. Attaining the rank of Eagle Scout is an outstanding achievement that is widely recognized as an indication of exceptional character, dedication, community service and leadership. 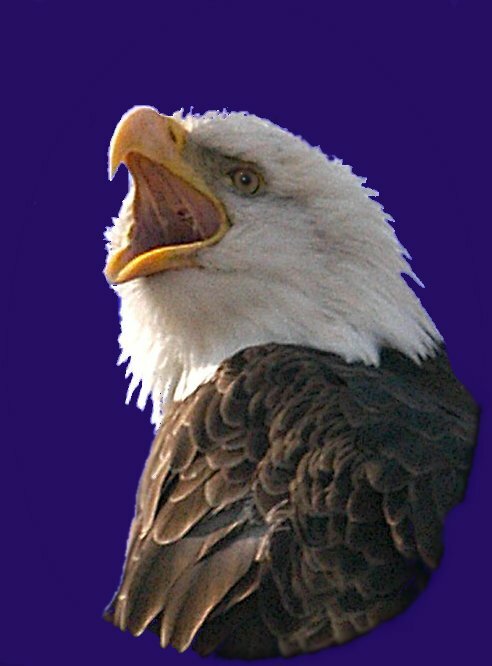 Troop 61 is extremely proud of the more than 300 scouts from our troop that have earned the rank of Eagle. This is a true testament to the spirit and tenacity of the scouts, the dedication of our adult leaders and the strength of our scouting program. Congratulations on a job well done, to each of you, and to your parents. You have much to be proud of. Joseph is the son of Steven and Linda. He was awarded his Eagle Badge at a Court of Honor at Beth Shalom on August 16th, 2010. Joseph is a Firebuilder in the Tribe of Mic-O-Say. His Tribal Name is Long Lasting Fire. Philip is the son of Chuck and Andrea. 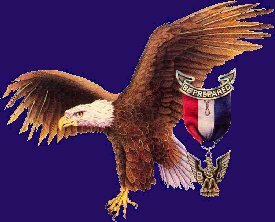 He was awarded his Eagle Badge at a Court of Honor at Beth Shalom on March 1st, 2010. Philip is a Firebuilder in the Tribe of Mic-O-Say. Ronnie is the son of Greg and Dawn. He was awarded his Eagle Badge at a Court of Honor at Beth Shalom on October 5th, 2009. Ronnie is a Tom Tom Beater in the Tribe of Mic-O-Say. His Tribal Name is Low Flying Owl. George is a Warrior in the Tribe of Mic-O-Say. His Tribal Name is Peace Keeper of the Guiding Light. 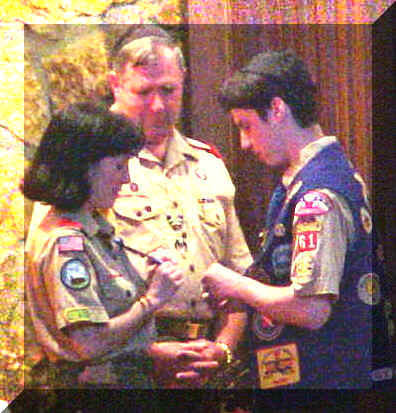 Austin was awarded his Eagle Badge at a Court of Honor at Beth Shalom on May 3rd, 2009. Austin is the son of Joe A. and Alisa R.
Austin is a Warrior in the Tribe of Mic-O-Say. Michael is the son of Tensy and Stuart and brother to Jessica and Ariel. He received his Eagle Scout Award in a Court of Honor held at Congregation Beth Shalom on October 6, 2008. Michael is a sophomore at Blue Valley North High School where he is an honor roll student and a member of the debate, soccer and tennis teams, FBLA, DECCA, Latin Club and the Jewish Student Union. Michael is also a member of Nordaunian AZA, a Vice-President on the USY Board at Beth Shalom and a board member of the B'Nai Tzedek Youth Council. Michael started his scouting career in Cub Scout Pack 3010. 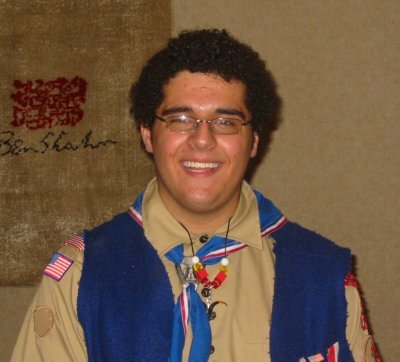 He crossed over to Troop 61 in 2004 and took off with great enthusiasm including his first session at Camp Bartle. That year he received the Etta Bayzman award as the first year camper with the most advancement. Michael has gone on to attend camp every year since then. 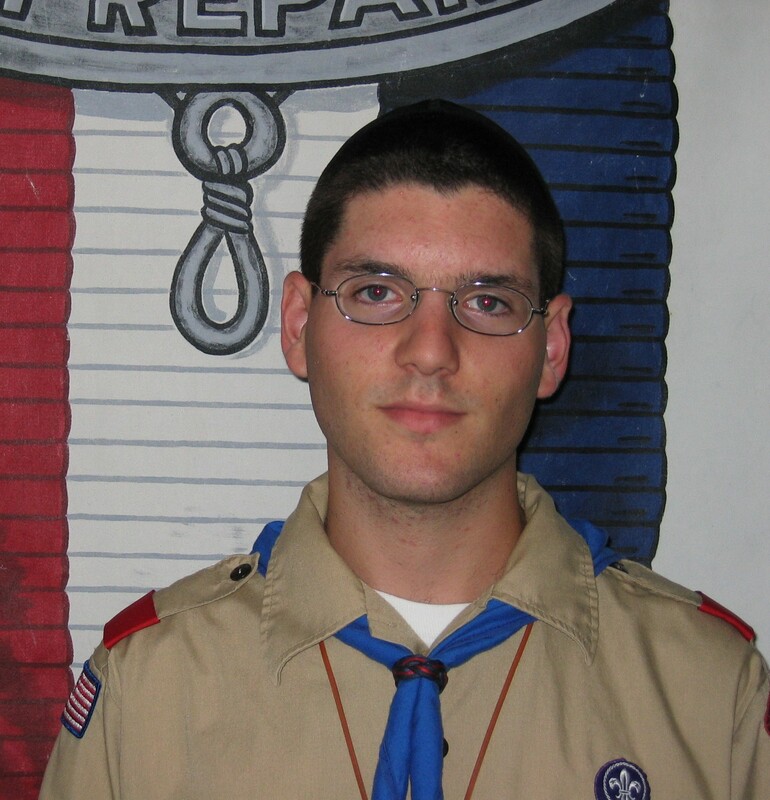 Currently Michael is the Assistant Senior Patrol Leader for Troop 61. His former positions in the Troop include Patrol Leader and Chaplain's Aid. In addition to earning the rank of Eagle Scout, Michael has also earned the Ner Tamid and the Etz Chaim religious awards. This has been a busy year for Michael, in addition to busy schedule, he completed his Eagle project, became a NAUI certified SCUBA diver and participated in a high adventure SCUBA trip to Roatan, Honduras. Michael's Eagle project involved leading two teams in the creation of a path and sitting area in the Butterfly Garden in Deanna Rose Children's Farmstead in Overland Park. The work involved removal of overgrown vegetation, building a fence, adding steps and mulching the entire area. Michael is a Warrior in the Tribe of Mic-O-Say. Jacob is the son of Ed and Ellyn. He received his Eagle Scout Award in a Court of Honor held at Congregation Beth Shalom on December 16, 2007. The ceremony included the guest speakers Professor David W. Miller from the University of Illinois and United States Congressman Dennis Moore. Jacob is a Runner in the Tribe of Mic-O-Say. 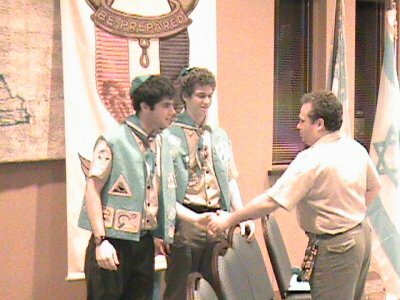 Josh received his Eagle Scout Award in a Court of Honor held at Congregation Beth Shalom on November 4, 2007. Josh is a Runner in the Tribe of Mic-O-Say. Alex is the son of Andrew and Andrea. 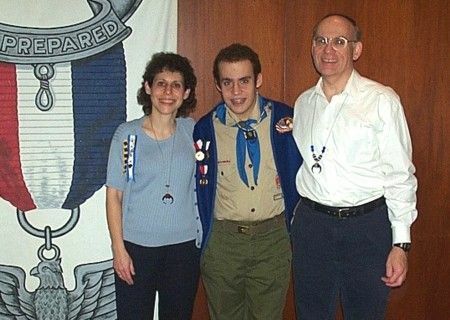 He earned his Eagle Badge on May 17, 2007, and he received his Eagle Scout Award in a Court of Honor held at Congregation Beth Shalom on September 9, 2007. Alex is a Senior at Olathe North where he is an Honor Roll student. Alex has completed AP courses in both History and English, and he achieved an Excellence in English Award. Alex's talent for writing began at an early age. When he was in the third grade, he was recognized at the Olathe District Schools Young Author's Celebration for a book he wrote on Cheetahs. Alex began his scouting career in first grade as a Tiger Cub in Pack 3204. Alex set his sights high and earned the Arrow of Light Award before crossing over to Troop 61 at the age of eleven. Alex has attended H. Roe Bartle summer camp every year since he joined Troop 61. Alex has worked on staff at both Camp Naish and Camp Bartle. He has earned 37 merit badges and the special World Conservation Award. He has held the positions of Patrol Leader, Assistant Quarter Master, Troop Guide and Instructor. Alex is a Runner in the Tribe of Mic-O-Say and his tribal name is Grasshopper of Harness Lightning. For his Eagle project, Alex planned, organized and directed the removal of a 420 foot fence for the Theater in The Park in Shawnee Mission. The project also included installing a 30 foot wooden fence and mulching around trees. Alex plans to attend college and become a graphic artist in the video game industry. He also plans to remain active in scouting to continue to help others. Alex is a Runner in the Tribe of Mic-O-Say. Gregory is the son of Jeff and Debbie, and the younger brother of Adam and Jonathan. He received his Eagle Scout Award in a Court of Honor held at Congregation Beth Shalom. Gregory is currently a senior at Blue Valley North High School, where he has an internship with Blue Valley Television on a weekly news program broadcast to the entire school district. Gregory's work at the station includes filming and editing. Gregory is also in BBYO and he has been involved in softball and soccer. He also works part time at the Jewish Community Center Sports Desk. After visiting his older brother Jonathan at scout camp each year, Gregory could not wait to join and he has been an active member of Troop 61 since he was eleven. Gregory has participated in several high adventure trips including the Northern Tier Boundary Waters canoe trip and a SCUBA diving trip in the Caribbean, where he learned how to sail and participated in a reef restoration project. One of the most memorable events of his scouting career was becoming a member of the tribe of Mic-O-Say. For his Eagle project Gregory designed a landscape renovation for the Compassion House part of the Good Shepard Manor, which is a network of homes for adults with special needs. The project included leading a large crew of scouts and adults in the landscape construction, planting and installation of a fountain. Gregory's future plans include studying film at the KU, of which both his brothers are Alumni. While he will be away at school, he plans to remain active with Troop 61 in the future. Gregory is a Tom Tom Beater in the Tribe of Mic-O-Say. David W. and Benjamin T. both received their Eagle Scout Awards in a Court of Honor held at Congregation Beth Shalom. David is the son of Bruce and Julia. He is a senior at Blue Valley North where he participates in Varsity Debate, Future Business Leaders of America, National Honor Society, and serves as a freshman mentor. David spends his Sunday mornings performing community service on behalf of Congregation Beth Torah. David's scouting career started in pack 3010 as a Tiger Cub. 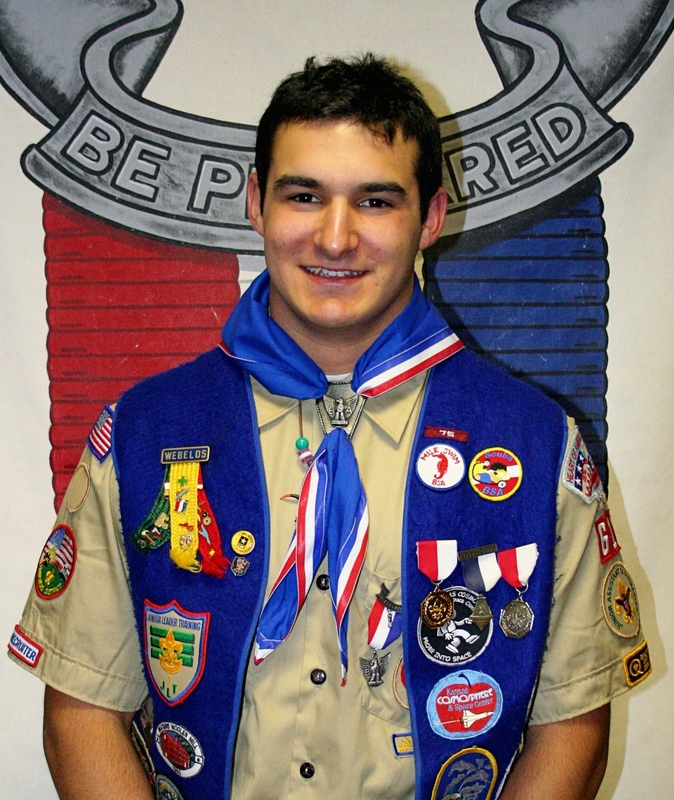 Prior to joining Troop 61, David earned the Arrow of Light Award. Throughout David's tenure in Troop 61 he has served as Assistant Senior Patrol Leader, Troop Guide, Patrol Leader, and Assistant Patrol Leader. His most memorable scouting moments are the high adventures he has attended: Philmont, Philmont HH (twice), and Northern Tier. David served as crew leader at Northern Tier and once at Philmont HH. 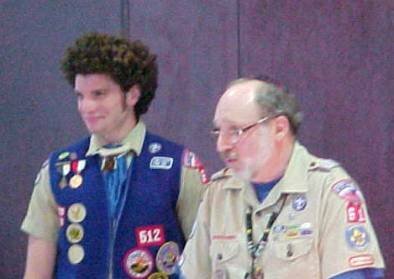 Another proud moment of David's scouting career was when he earned the Ner Tamid religious award. For his eagle project, David led a group of volunteers in converting two storage rooms into usable workspaces for cleaning the hard drives of older computers at the JVS shelter workshop. The JVS shelter workshop provides employment, structure, and stability to members of the community that have physical disabilities, developmental disabilities, or acculturation difficulties. Ben is the son of Robert and Valerie. He is a senior at Blue Valley North where he is active in Debate, Junior Classical League, Future Business Leaders of America, National Honor Society, Track and the Anarchy Club. Ben also volunteers at the Polsky Religious School, helping teach elementary age students. Ben started with Scouting as a Tiger Cub in Pack 3153. 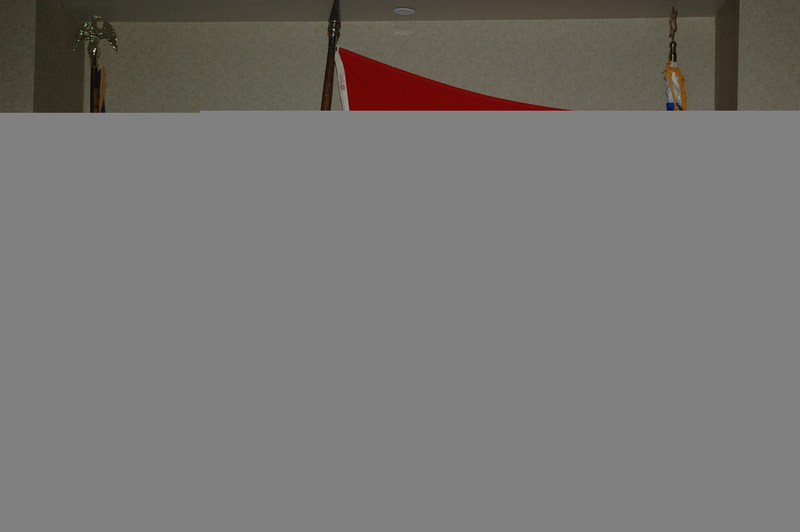 He participated in two Pinewood Derbies and one regatta derby. In his second Pinewood Derby, he won the award for best car design. He joined Troop 61 in 2000. Ben has been an Assistant Patrol Leader, Patrol Leader, Troop Guide, and is currently a Junior Assistant Scoutmaster. Last year he earned his Etz Chaim religious award. Ben has also participated in five high adventure programs - one at Philmont, three at Double H Ranch and one at Northern Tier. Ben has attended Camp Bartle for six sessions. The skills and lessons Ben has learned through Scouting have greatly influenced his life in many ways. For his Eagle service project, Ben designed and led volunteers in building two large hanging wall cubbies and a platform on wheels designed to hold children's scooters for the Lee Ann Britain Infant Development Center at Shawnee Mission Medical Center. The IDC provides therapy for developmentally challenged children from birth to age six. Both boys are congratulated by Ron F.
David and Ben are both Warriors in the Tribe of Mic-O-Say. 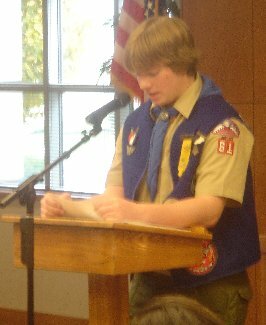 Andrew K., son of Lena and Jeff, received his Eagle Scout award at a special Court of Honor held at Congregation Beth Shalom. 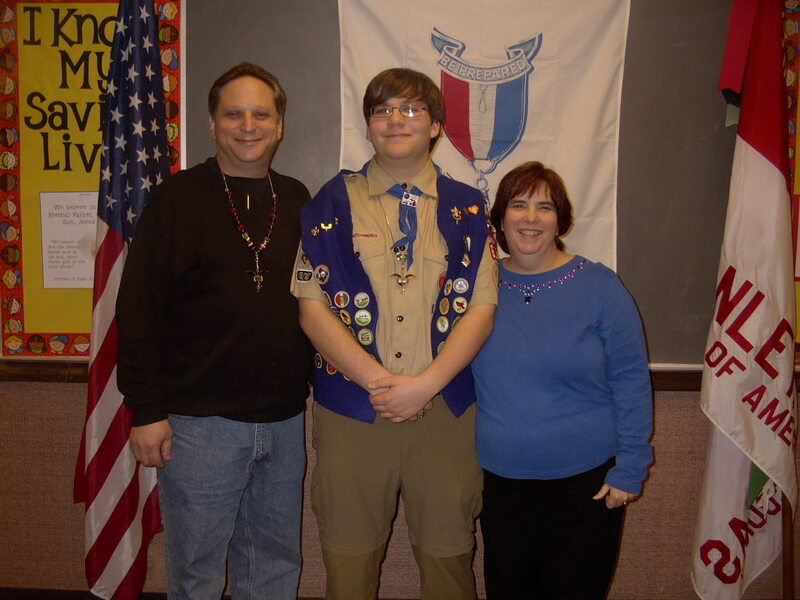 Andrew is proud to continue his family's tradition as a third generation Eagle Scout. Andrew began his scouting career with Cub Pack 3583 at Valley Park Elementary School. As a Cub Scout he earned his Arrow of Light. 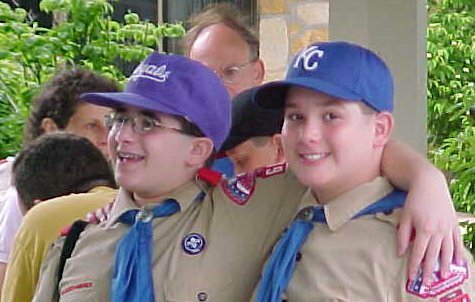 Andrew crossed over into Troop 61 in 2001. He has held several leadership positions within the troop including Librarian, Instructor, Assistant Patrol Leader, Patrol Leader and Troop Guide. This past summer Andrew held the position of Chaplain's Aide at the Double H Scout Reservation High Adventure trip. He is a recipient of the Troop 61 Etta Bayzman Award for most advancement at the H. Roe Bartle Scout Reservation. For his Eagle project, Andrew organized and orchestrated crews of Boy Scouts to work on improvements at the Harris Youth and Sports Activities Park in the urban core of Kansas City. Projects included completing the final construction of the playground surface, painting the block long security fence on the park grounds and the overall general maintenance of the entire park grounds including the sand volleyball and miniature golf areas. Andrew is a senior at The Barstow School where he is an honor roll student. Andrew has participated in Wrestling, Debate, Varsity Tennis, and the B'nai B'rith Yourth Organization. Andrew is a Warrior in the Tribe of Mic-O-Say. Ben S. is the son of Mike and Debbie. 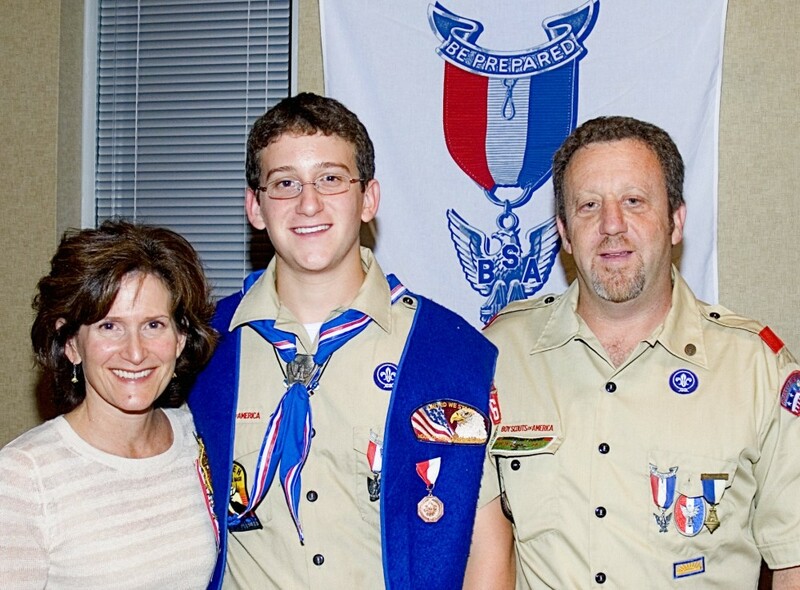 Ben was awarded his Eagle Scout award at a special Eagle Court of Honor held at Congregation Beth Shalom. Ben began his scouting journey in first grade by joining Pack 3002 at Tomahawk Ridge Elementary School. Ben went on to earned the Arrow of Light, the highest award in Cub Scouts. He then crossed over to Boy Scouts and joined Troop 61 in 2000. 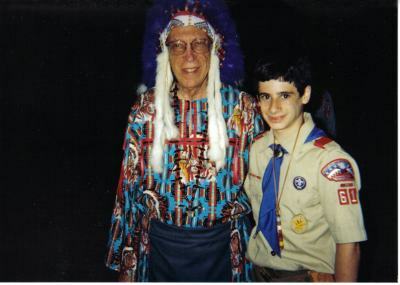 Ben's grandfather, for whom he was named, was also a member of Troop 61. 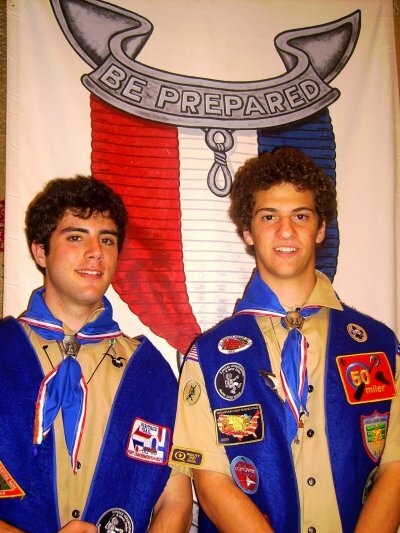 Ben's uncle Louis K. and his cousin Adam S. are also Eagles in Troop 61. Ben has held a number of leadership positions including Assistant Patrol Leader, Patrol Leader, Assistant Senior Patrol Leader and Troop Guide. He is currently serving as Assistant Scoutmaster. Ben has participated in three High Adventure trips including Northern Tier and two trips to Double H. On the last trip he served as crew leader of the 706AA Double H Crew. For his Eagle project, Ben led a group of scouts and adult leaders in the renovation of the parking lot at the Jewish Vocational Services Center. The project included repainting all of the parking space lines, signs and an adjacent wall and fence. Ben is a senior at Blue Valley North High School, where he is on the Honor Roll. He also takes classes in Culinary Arts at the Broadmoor Technical Center. His culinary skills are well known among the members to Troop 61. He has been on the Wrestling Team and is involved in Skills USA. Ben also serves as a Junior Board Member of the Asthma and Allergy Foundation of America and was named Volunteer of the Year. Ben is a Firebuilder in the Tribe of Mic-O-Say. His tribal name is Screaming Nighthawk in the Moonlit Sky. Ethan L. is the son of Sandy and Ida. He was awarded his Eagle Scout award at a special Eagle Court of Honor held at Congregation Beth Shalom. Ethan began his scouting career as a Tiger Cub in Pack 1116 at Dulles Elementary School in Sugar Land, Texas. Ethan continued in Cub Scouts after moving to Kansas, joining Pack 3131 at Sunset Ridge Elementary School. Ethan was very active in Cub Scouts, he earned all 20 of the Webelos activity pins and was awarded the Arrow of Light, the highest award in Cub Scouts. Ethan crossed over into Boy Scouts, joining Troop 61 in 2002. He has held several leadership positions including Musician, Instructor, Assistant Patrol Leader and Patrol Leader. Ethan has earned both the Maccabee and Ner Tamid religious awards. For his Eagle project, Ethan organized and worked with volunteers to pack offices, storerooms and the Library of Congregation Beth Shalom for the move to the Lamar Campus. He also assisted in unpacking the Library. Ethan is a Sophomore at Blue Valley West High School, where he is active in the Marching Band. He is a member of the 2006-2007 Band Council and holds the position of Quartermaster. Ethan is also a student at the Community High School of Jewish Studies. Ethan is a Brave in the Tribe of Mic-O-Say. Aaron and Jacob E. are the sons of Matthew and Gloria. Both boys were awarded their Eagle Scout award at a special Eagle Court of Honor held at Congregation Beth Shalom. Aaron’s Eagle Project involved building shelving for Grandma’s House, a shelter for kids ranging from newborns to 2 year olds, whose parents are incarcerated. Because of his dedication to the project, the executive board of Gracious Promise, the benefactor of Aaron’s work, honored him with its’ first ever Youth Volunteer Award. Jacob’s Eagle Project was a door-to-door baby good drive in the Shannon Valley area benefiting Hope House, a non-profit organization that helps women escape domestic violence. He was also assisted by donations from Steven Kohn, general manager of the Durry Inn Airport and Babies R’ Us. Both Eagle Scouts earned their religious award, the Ner Tamid. 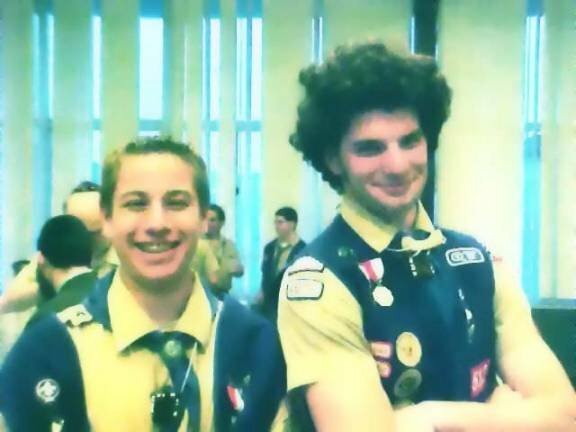 The two Scouts are also members of AZA #2. Aaron has attended the 2006 Chapter Leadership Training Conference in Los Angeles. Jacob attended the 2005 CLTC in Los Angeles, and just returned from BBYO’s International Leadership Training Conference in Starlight, Pa.
Aaron is a junior and Jacob is a senior at Blue Valley Northwest High School. 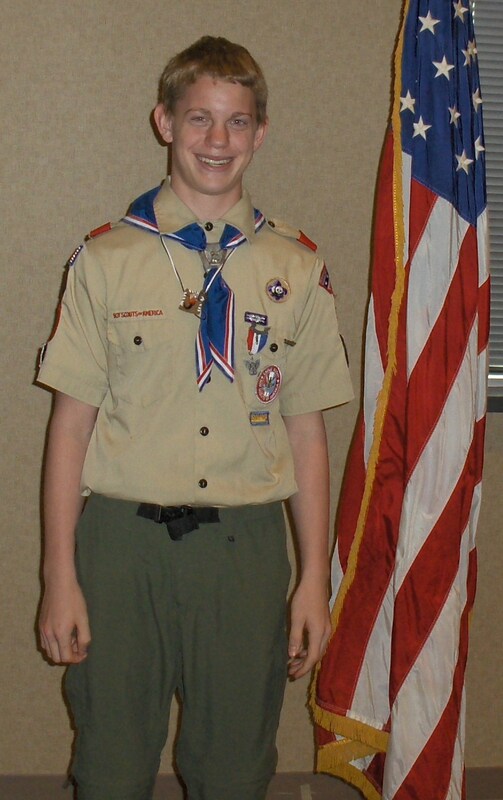 Besides Boy Scouts, Aaron is involved with BVNW Football, Track and Field, Band, Student Government and Youth Court. Jacob is a Class Officer for the Class of 2007, and member of Student Government. He is also involved with Choir, and Theatre Company. Both boys are Firebuilders in the Tribe of Mic-O-Say. David C. is the son of Howard and Debbi. 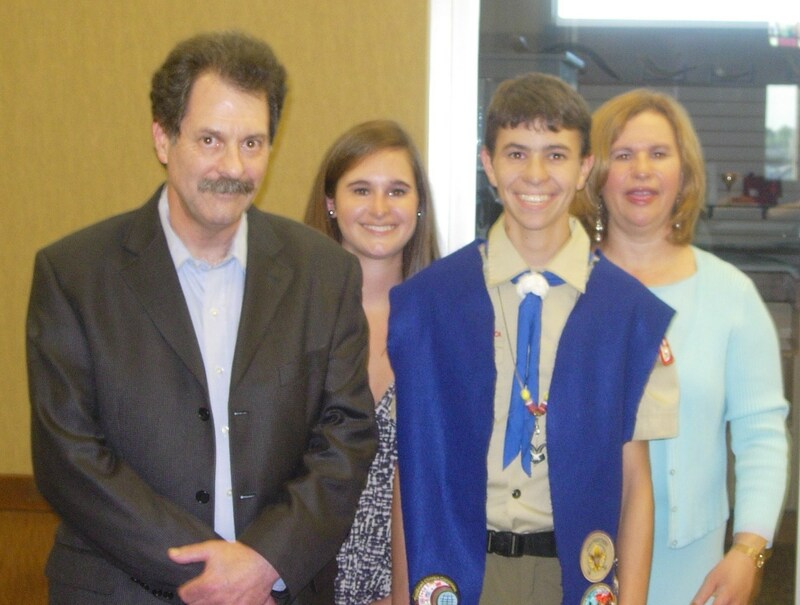 David was awarded his Eagle Scout award at a special Eagle Court of Honor held at Congregation Beth Shalom. For his Eagle project, David organized the warehouse at the Jewish Vocational Services. He led volunteers in the clean up of the warehouse and the sorting of clothing in order to make it easier for new immigrants to find suitable clothing. David began his scouting experience in the second grade with Cub Pack 3385 at Mission Trail Elementary School. As a Cub Scout he earned the Arrow of Light Award. David crossed over into Boy Scout Troop 61 in February of 2000. David has held many leadership positions within the troop -- Patrol Leader, Troop Guide, Senior Patrol Leader, and is currently a Jr. Asst. Scoutmaster. He has earned the Ner Tamid religious award and the Paul Bayzman and Leonard Bayzman Awards for Outstanding Achievement in Scouting. Football, Wrestling, Track and Field, Yearbook, Future Business Leaders of America, Latin Club, and is on the Principal's Honor Roll. David is a Firebuilder in the Tribe of Mic-O-Say. His tribal name is Black Panther Swimming in the Muddy Waters. 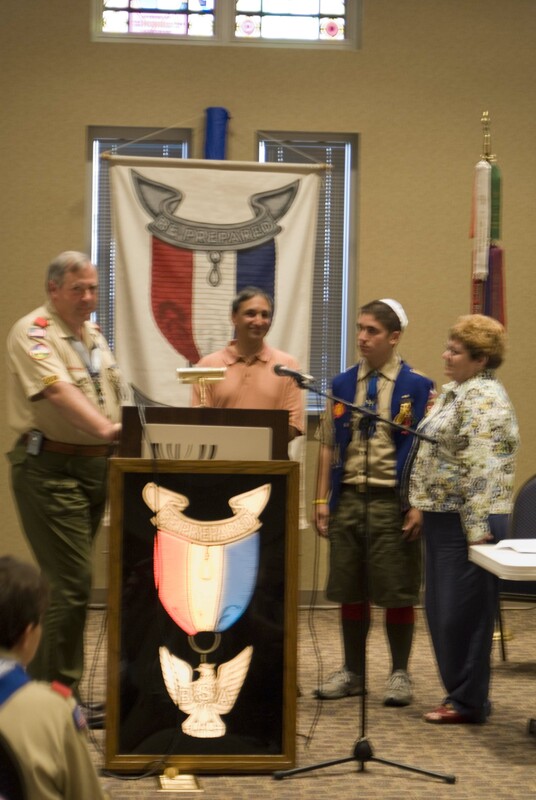 David, son of Sandy and Ida, received his Eagle Scout Award at a special Court of Honor held at Congregation Beth Shalom. 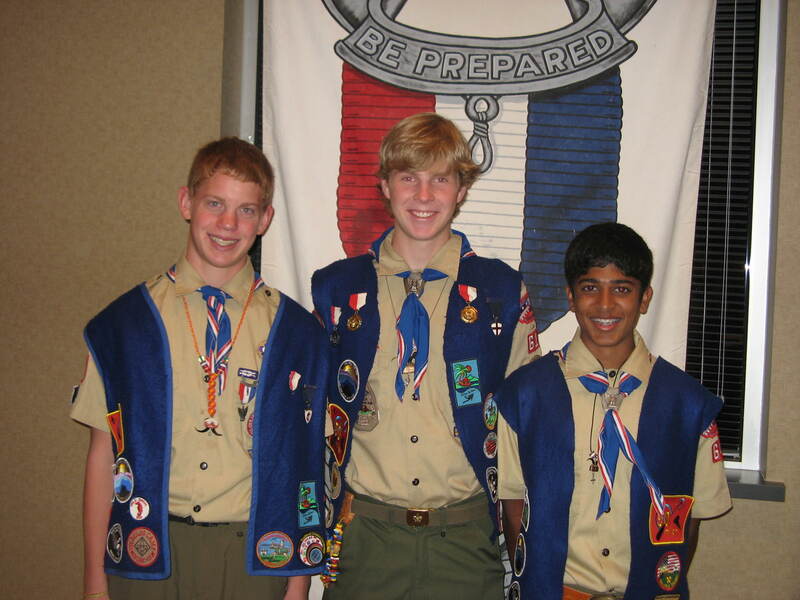 David began his scouting career in the second grade in Pack 1116 at Dulles Elementary School in Sugar Land, Texas. As a Cub Scout, he earned his Arrow of Light award. 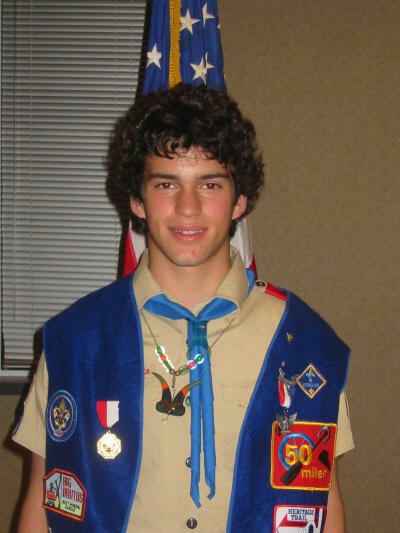 David crossed over into Troop 301 of Meadows Place, Texas in 1999. During his tenure there, he held several leadership positions including Chaplain's Aide, Assistant Patrol Leader and Patrol Leader. He was also a member of the troop's First Aid Competition Team. David achieved the rank of Star Scout prior to moving to Kansas in 2001. He then joined Troop 61 where he has held the leadership positions of Instructor, Troop Guide and Assistant Senior Patrol Leader. 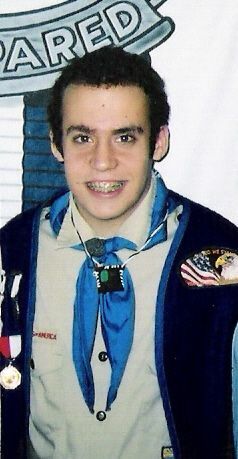 David attended Brownsea, the Heart of America Council Junior Leader Training Conference, in 2002. He has also participated in two high-adventure programs with Troop 61 -- Philmont Scout Ranch and Double H Ranch. David has earned his Ner Tamid religious award. For his Eagle project, David organized volunteers to dismantle a bird watching stand at the Overland Park Arboretum. The materials were then moved to another section of the Arboretum where the group reused the materials to build a puppet stage in the children's area. David is a senior at Blue Valley West High School where he is active in Marching Band and the Future Business Leaders of America. He is a graduate of the Community High School of Jewish Studies and was confirmed at Congregation Beth Shalom in 2004. 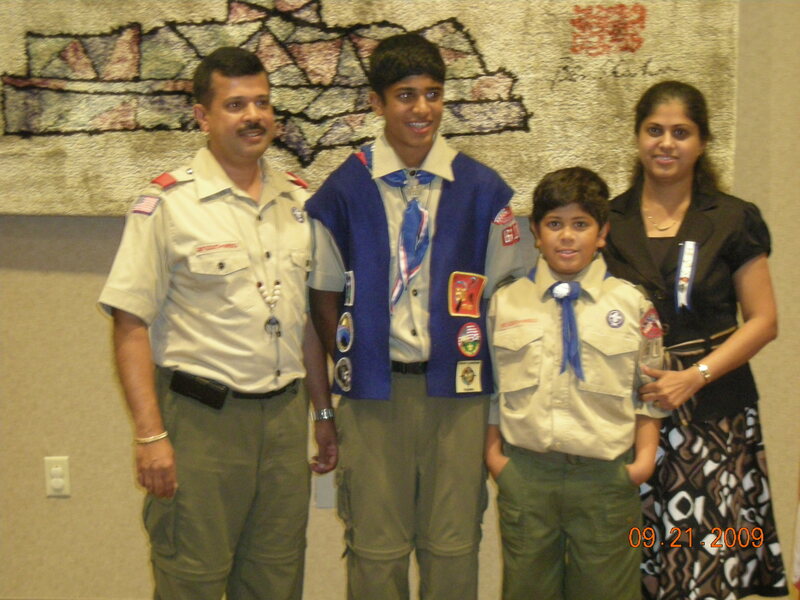 Justin C's parents, Tom C. and Roshann P. are proud to announce that their son became an Eagle Scout on Sunday Nov. 21, 2004 at his Eagle Court, which was held at the Leawood Community Center. 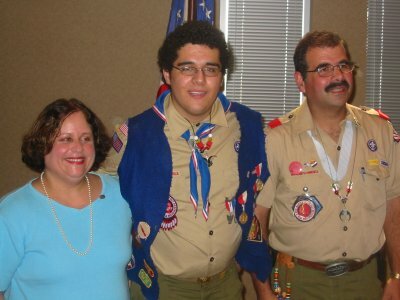 Justin, age 16 is a member of Troop 61. He became active in scouting as a cub scout and then joined Troop 61 in April 1999. His Eagle project was to install a new recreational flooring system at the Boys and Girls Club Thornberry unit. He thanks everyone who contributed to this project. While in scouting, Justin earned 25 merit badges including the religious award for Jewish Scouting, the Ner Tamid. Justin is also a brave in the tribe of Mic-o-Say. This past summer Justin participated in a high adventure-scouting trip to the Boy Scouts Northern Tier base in Atikokan, Canada. There he and others in his troop paddled for over 50 miles in Quetico National Park and portaged through some challenging terrain. Justin is currently a junior at Blue Valley North High School and is a member of Congregation Beth Torah. Justin is the 294th scout to attain Eagle Scout rank in Troop 61’s 79-year history. Guest speakers and presenters included the Mayor of Leawood, the presiding Chieftain of the Tribe of Mic O Say, the President and CEO of the Boys and Girls Club of Greater Kansas City and the President of the Kansas City School Board, the 1997 presiding Chieftain of the Tribe of Mic O say, scout members of Troop 61 and our Scoutmaster. Robert G. is the son of Al and Debbie G. For his Eagle project, Robert organized a food drive to benefit the Yachad Food Pantry -- Kansas City's Kosher Food Pantry. Leading a crew of 21 scouts and adult leaders, Robert conducted a store-contact and door-to-door campaign. Over 1660 items were collected and delivered to the food pantry. Robert is a freshman at Blue Valley Northwest High School. He has been a member of Boy Scout Troop 61 since 2001, and is a member in the Tribe of Mic-O-Say. He has earned 25 merit badges and his Ner Tamid religious award. He also earned his Aleph religious award as a Cub Scout. In 2001, Robert was awarded the Etta Bayzman award as a first-year camper with the most advancement and received the Arthur Herzmark award in 2003 for the scout with most advancement in a 12-month period. Robert is the 293rd scout to attain Eagle Scout rank in Troop 61's 79-year history. Max joined Troop 61 in 1996. He attended the 1997 National Jamboree with Troop 406 of Old Colony Council of Massachusetts. Max held a number of roles in the troop, including Senior Patrol Leader and Junior Assistant Scoutmaster. He earned 24 merit badges and the Neir Tamid religious award. He was also given the 1997 Advancement Award. Max is a warrior in the Tribe of Mic-O-Say. Max's mother, Lisa receives her Eagle pin as his father, Dana watches. New to this Eagle Court of Honor, a father's pin was also awarded (previous picture). Charlie B. is Troop 61's 291st scout to reach the rank of Eagle. Presentation of the Eagle candidate was made by Alan Lebovitz. Charlie had Jonathan D. as his guest speaker. Eagle Remarks and Charge was given by Dana Gibson. Eagle presentation was given by Al Beitchman. The National Eagle Scout Association presentation was given by Harvey Bodker. Charles (Charlie) began his scouting career in 1999. He was awarded the Minie Bayzman award that year for earning 13 merit badges at the H. Roe Bartle Scout reservation. Charlie also earned his religious Ner Tamid Award and is a Brave in the Tribe of Mic O Say. For Charlie's Eagle project, he organized 11 scouts and 5 adult leaders to participate in an extensive marketing program for the Health Partnership Clinic (HPC) in an effort to attract new patients, boost volunteer participation, and increase financial support. HPC is a non-profit organization which provides free acute medical care and dental services to uninsured Johnson County, Kansas residents. Charlie led the scouts and adults in up-dating existing HPC posters by adding informational stickers and by distributing the posters and informational brochures to grocery stores through out Johnson County area. Charlie's mother receives her Eagle pin, while Charlie's step father watches. 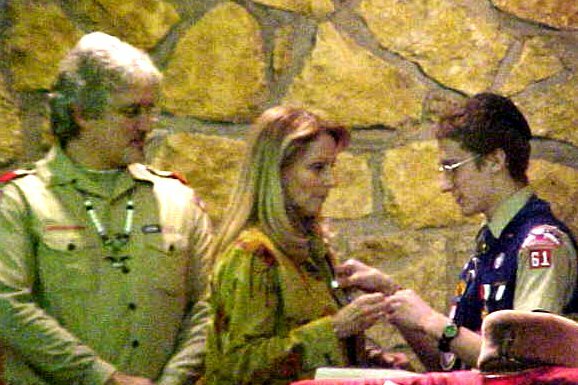 On May 6th 2002, at an Eagle Court of Honor, two Troop 61 Scouts received their Eagle Scout award. Jason C. on the left, Alex C. on the right. Alex C. is Troop 61's 289th scout to reach the rank of Eagle. Presentation of the Eagle candidate was made by Dr. Norman Kahn. Alex C. had Rabbi Mendy Weinburg as his guest speaker. Eagle Remarks and Charge was given by Dana Gibson. Eagle presentation was given by Al Beitchman. The National Eagle Scout Association presentation was given by Harvey Bodker. Alex began his scouting career in 1996. His advancement to the rank of Eagle was challenging, but after countless overnight hikes, numerous merit badges and 3 sessions at H. Roe Bartle Reservation, he has reached his goal. Alex also participated in a 6 week multiple Scouting activities event last summer to include Jr. Leadership Training and a High Adventure experience. He also participated in the International Boy Scout Jamboree in Ft. A.P. Hill, Va. last summer, 2001. Alex has been very fortunate to have the outstanding leadership of many people that have given their time and encouragement to help him reach this milestone. Another motivation was his three older brothers Erik, Scott and Zachary all of whom are Eagle Scouts. Alex earned his Ner Tamid in 1998. His scouting experiences have taught him about leadership, survival, ethics and responsibility. All of these values will benefit him in his adult life. For Alex's Eagle project, he organized a crew to refurbish and upgrade the basketball court at the Chabad House Center. They filled in holes, sealed the cracks, painted the goals and painted the lines on the court. With the help of his brothers and many others, the project was very successful. Alex would like to thank everyone who participated in this project and Rabbi Weinburg for all of his help. Jason C. is Troop 61's 290th scout to reach the rank of Eagle. Presentation of the Eagle candidate was made by Mike McHugh. Jason C. had Dr. Norman Kahn as his guest speaker. Eagle remarks and Charge was given by Dana Gibson. Eagle presentation was given by Al Beitchman. The National Eagle Scout Association presentation was given by Harvey Bodker. Jason began his scouting career in 1994. His advancement to the rank of Eagle was challenging, but after countless overnight hikes, numerous merit badges and 4 sessions at H. Roe Bartle Reservation, he has reached his goal. Jason also participated in a 50-mile hike trek to Philmont Ranch in New Mexico last summer. Jason earned his Ner Tamid award and is a member of the tribe of Mic-O-Say. Jason has been very lucky to have the outstanding leadership of many people that have given their time and encouragement to help him reach this milestone. His scouting experiences have taught him about leadership, survival, ethics and responsibility. All of these values will benefit him in his adult life. For Jason's Eagle Project, he organized a crew to clean out the lower level of the new ACLU building. When the ACLU purchased their new building the previous owners left a lot of garbage in the lower level. Jason organized the clean up and remodeling of the space so that it could be used for a conference area. They filled in holes, sealed the cracks, painted, varnished, and put up new lighting. With the help of many volunteers, the project was very successful. Jason would like to thank everyone who participated in this project and Susan Perry for allowing him to undertake this job. Jason's Tribal name is Swift Silent Gold Fox. Marty A Steve A Stephan B Scott C Philip G.
Benji B Gregory A Jonathan F Zach C Joseph H.
Ron F Kent P Jack L Eric S.
Morris L David B Barry S Mike H Paul K.
Leonard B Spenser B Jay S Hanan B David W Gregory N Jason L Alex C Donny Z.
Jonathan P Andrew S Jason C Austin R.
Leo G Allan B Gary A Joel F Steve K Brian A Seth F Charlie B. Benjamin S.
Marvin Y Stanley B Steve B Doug A Neil N Zachary B Robert G.
Marvin B Richard L Arnold K Jeff A Stephen H Elli G Benjamin F David W.
Adam S Jonathan H Benjamin T.